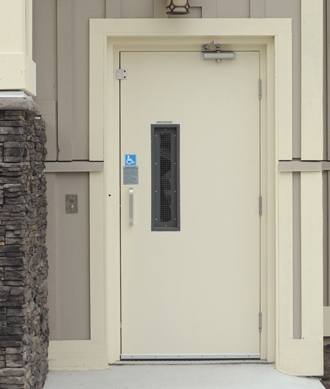 Your Elvoron CPL will be a key feature of your building. Interior design and finish are important considerations. We offer a variety of attractive and durable wall and ceiling finishes as shown below. All lifts are supplied with basic plywood floors ready for installation of your preferred flooring material, as supplied by others. - Durable and easy to clean. Offered in a choice of 8 colors. Melamine Cab Wall Selection - Economical finishes. Offered in a choice of 7 colors. The CPL features a unique egg crate style ceiling as required by national safety codes for vertical platform lifts equipped with full height cabs. The perimeter of ceiling is fitted with 4 low voltage L.E.D. lamps that illuminate automatically. This perimeter ceiling area is available in white. All Elvoron cars are equipped with one handrail on the control wall. The handrails are available in one standard finish or can be customized. Additional handrails can be mounted on the other car walls for extra passenger security.